Every now and then I have one of those moments in life where I just know that I am in the midst of something historic, something important, something special. A moment where I am certain that a course has been forever altered. Activists like myself live for these moments. These moments are the positive affirmations of the endless hours of work we have put into a cause. They are the fuel that keeps our tank running, pushing us onward in our journey for positive change. This weekend, at the 2015 NYSUT Representative Assembly in Buffalo, I had one of those moments. Moore’s comments struck at the heart of the issue that lead to the creation of the STCaucus. Within NYSUT far too many locals across the state have become disenfranchised, feeling as though their statewide union has abandoned them, it’s leadership acting only in their own best interests and not in ways that benefit the 600,000 members they represent. Whether it be officers who had only been in office for four months giving themselves a 2% raise (on already hefty salaries) or wasting VOTE-COPE dollars on candidates who are clear enemies of public education, NYSUT rank and file membership has reached a breaking point. To get a sense of where STCaucus stands, one only has to look at the constitutional amendments that they authored for consideration at the RA. The first amendment, called for there to be regional voting for the election of NYSUT officers. Last year, during the elections for NYSUT officers, a mere 30% of NYSUT’s locals participated. One of the largest reasons for this was the fact that many small locals (several across the state are below 100 total members) simply do not have the economic means to pay for their delegates to travel to New York City and stay at the Hilton for a weekend. Of course with the voting always taking place in New York City and with the enormous amount of dues money that they collect, the UFT is always able to send their 800 delegates (all of whom have taken an oath to vote as they are told by their leadership) to the RA. This sort of situation undermines democracy within our union and contributes to thousands of members feeling as though they do not have a voice. STCaucus’ amendment would have allowed the delegates of every local across the state to vote at their own regional office. This likely would never cause any delegate to have to travel more than a couple of hours and certainly wouldn't necessitate an overnight stay in the most expensive city in the state. It is a common sense idea that would further the democratic process within our union. Naturally, the New York State Unity Caucus instructed their members to vote against it. The next amendment would have dictated how at-large directors are elected. Currently delegates from the entire state are allowed to vote for all the at-large directors, most of whom work in different regions. This allows Unity Caucus to use the weight of their 800 UFT delegates to determine at-large directors who represent parts of the state outside of New York City. Last year, for example, the at-large director representing my area of Long Island received less than 10% of the votes in our area. However because she had the Unity Caucus endorsement she received all of the UFT votes and now represents our area of Long Island. It is akin to New Yorkers voting for members of congress in Wyoming, Georgia, or any other state outside of ours. It was another common sense amendment that would allow all regions of the state to feel represented. Once again the New York State Unity Caucus instructed their members to vote against it. At this time, however, it is important to note that while the amendments were voted down on Friday night, it is likely that they went down simply because ⅔ of a vote is needed for a constitutional amendment. On the floor of the RA most seemed to believe that the split was close to 50/50. That in itself is an extremely important development as it marked the arrival, for the very first time, of an organized opposition to Unity Caucus who carries a comparable number of voters. The validity of the caucus was furthered the next day when both a resolution and a special order of business authored by the STCaucus were passed unanimously after an agreement was negotiated between the leaders of the two caucuses. The resolution, known to many as the IRefuse resolution, had two resolves added to it. The first one strengthened the resolution by requiring NYSUT to send it on to the federal government. The second resolve allows each local the ability to decide how they share the resolution with their membership. The special order of business called on NYSUT to oppose NYSED’s college and career readiness standards. The compromise resulted in a resolve being removed from the end requiring NYSUT to launch a financial campaign. If it had not been removed the special order of business could have been ruled out of order. The takeaway from all of this wasn't so much how the resolutions were or were not changed. Rather it is that instead of just voting down what they didn’t want, as they would have in the past, Unity Caucus felt the need to negotiate because they could no longer be confident that they would have the numbers to impose their will on the entire convention of delegates. It was validation that there is now another loud voice in the room when it comes to governing NYSUT. The significance doesn't end there though. The arrival of a formative opposition to Unity Caucus could have a deep impact on the national level as well. NYSUT carries enormous weight within AFT voting. STCaucus has the ability to significantly alter how the votes are cast. In addition, there are strong indications that STCaucus will be joining with the United Caucuses of Rank and File Educators (UCORE), a network of social justice oriented caucuses around the country including CORE in Chicago, Union Power in Los Angeles, MORE in New York City, the Caucus of Working Educators in Philadelphia, and the NEW Caucus in Newark among several others. There is certain to be collaboration among these caucuses leading up to the 2016 AFT Convention in Minneapolis. 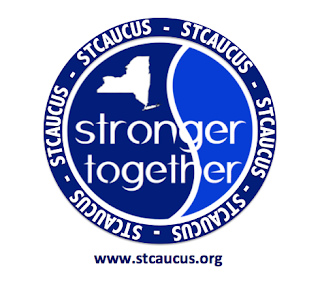 Finally, the emergence of STCaucus is significant for the rank and file NYSUT members across the state of New York. While the New York State Unity Caucus is only open to NYSUT delegates and the UFT’s Unity Caucus is by invitation only, STCaucus is open to all NYSUT members across the state to join. There is talk of regional meetings being held to listen to what is important from membership and each region of the state had a vice-chair elected to keep the pulse of what is happening in their region and what issues are important to their members. To join STCaucus visit this site. I strongly encourage all NYSUT members to do so to ensure that your voice is heard within the governance of NYSUT. Additionally you can “Like” STCaucus on Facebook and follow them on Twitter. There were other story lines to come out of the RA as well. President Karen Magee’s inability to follow protocol, for example, refusing to go to a vote count after calls of yea or nay proved inconclusive on one vote. While Beth Dimino and several others called for a vote count and Mike Lillis attempted to make a point of order, Magee refused to turn Lillis’ mic on and simply declared the constitutional amendment votes a victory for Unity. Listening to the absurd arguments from Unity Caucus members during debates would have been comical if not so sad. For example when an amendment was debated about whether or not to add another officer position (at a compensation package that would cost NYSUT in excess of $500,000) some Unity members argued that NYSUT was in wonderful shape financially and that we could certainly afford such an extravagance. Mere moments later, when discussing STCaucus’ amendment to move to regional voting, those very same Unity members argued that such a change would be far too expensive. In other words, plenty of money for expensive officer positions, not enough money for furthering democracy. Another argument against regional voting was that it would deter delegates from attending the RA and that their attendance was extremely important as it is where the governing of NYSUT took place. On Saturday afternoon a Unity Caucus member requested all remaining resolutions and orders of business be dealt with by the board of directors at a later date rather than by the NYSUT delegates who remained at the RA. When Freeport’s Stuart Napear (an STCaucus member) argued against the motion a Unity delegate pointed out that there likely was no longer a quorum in the room. Upon counting the delegates Magee revealed that in fact there was no longer a quorum present and the RA was embarrassingly brought to an immediate end. Still, emerging from STCaucus this weekend were names who we are sure to become familiar with as we move into a new era within NYSUT. Teachers whose passion for a more democratic union was inspirational to their union sisters and brothers. For example, Lakeland Federation of Teachers’ President Mike Lillis, who crafted and argued for the special order of business against the standards. Or Malone Federation of Teachers’ President Nathaniel Hathaway who argued so passionately in favor of regional voting that some Unity members seated near me admitted he made great points before ultimately voting against the call for democracy. Or perhaps Shenendehowa Teachers Association’s President Megan DeLaRosa who so skillfully highlighted the hypocrisy behind Unity Caucus voters voting in favor of a resolution that supported an increase in democratic voting in New York State only hours after they voted against a resolution that would further democracy within their own union. For those readers who have felt disenfranchised and shutout of their unions, this was an important weekend. One day we may very well point to the emergence of STCaucus as one of the defining moments in the fight for a democratic union who was truly capable of leading the fight for public education.